So my friends recently bought a house, and I thought what better for a house warming gift than some green cleaning items? 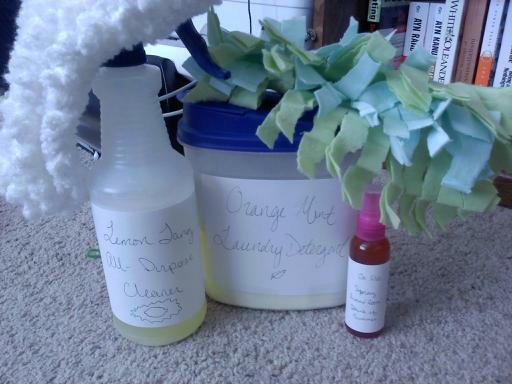 I made for them some lemon mint all purpose cleaner, some orange mint laundry detergent, some yummy air freshener, a swiffer duster and a swiffer mop duster 😀 yay! I was kind of on a mint kick. I made rosemary mint shampoo and conditioner this morning for myself. hehe. I very nearly have a perfect blend of ingredients for diy shampoo and conditioner so I’ll be posting that soon as well.